Pro- European Union demonstrators wave a mixed E.U. and Union Jack flag as they protest against Brexit outside of the British Houses of Parliament in central London on Monday, June 11, 2018. Conservative lawmaker Phillip Lee, who had voted to remain in the EU, resigned as the justice minister so he could speak out against the policy on Brexit. He said that while he was sad to leave the government, he believed many big changes were needed to make the U.K.'s exit a success. "If Brexit is worth doing, then it is certainly worth doing well; regardless of how long that takes," he said. "It is, however, irresponsible to proceed as we are." May's fragile government will be trying to defeat a rebellion by pro-EU lawmakers and reverse changes to its key piece of Brexit legislation as the matter comes before the House of Commons for two days of debate. May is resisting changes approved by the House of Lords that would soften Britain's exit from the EU, because she says they will weaken the government's negotiating position. 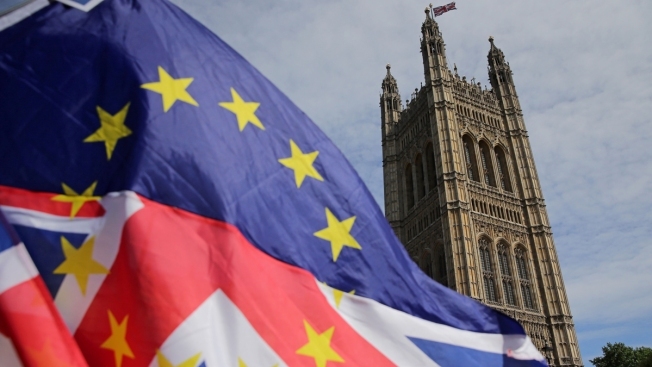 Brexit Secretary David Davis has warned Conservative Party rebels that proposals to give Parliament the power to direct negotiations with the EU are simply a tactic to overturn the results of the 2016 referendum that mandated Britain's departure from the bloc. Davis on Tuesday told the BBC, "that was the decision of the British people ... and whatever we do, we're not going to reverse that." Lee said that nonetheless, the present course raised questions of legitimacy because the end game was unclear. "When the government is able to set out an achievable, clearly defined path — one that has been properly considered, whose implications have been foreseen, and that is rooted in reality and evidence, not dreams and dogma - it should go to the people, once again, to seek their confirmation," he wrote.